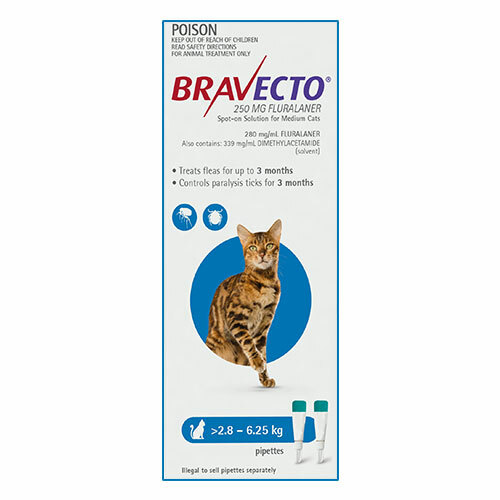 Bravecto Spot-On is indicated for the treatment of flea and tick infestations in cats. The single dose spot-on solution offers long-lasting effect against parasites for up to 3 months. It consistently kills fleas and paralysis ticks for 12 weeks and controls further parasitic infestations. The rapid action property kills fleas within 12 hours of application. Bravecto spot-on destroys existing adult fleas and newly emerged fleas before they lay eggs. It breaks the flea life cycle and controls recurring flea infestations. The topical solution also controls flea populations in surrounding areas of the treated cats. Bravecto spot-on is highly beneficial in the treatment strategy of flea allergy dermatitis. Safe to use on kittens above 11 weeks of age and over 1.2 kg. 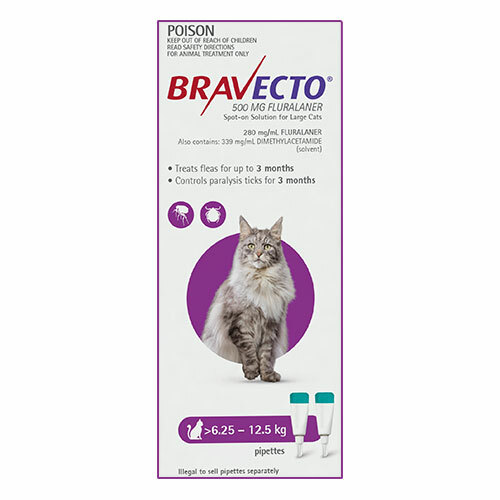 Bravecto Spot on Cats 1 pipette offers 3 months protection from fleas and paralysis ticks. Each pack contains 2 pipettes offering total 6-month protection. 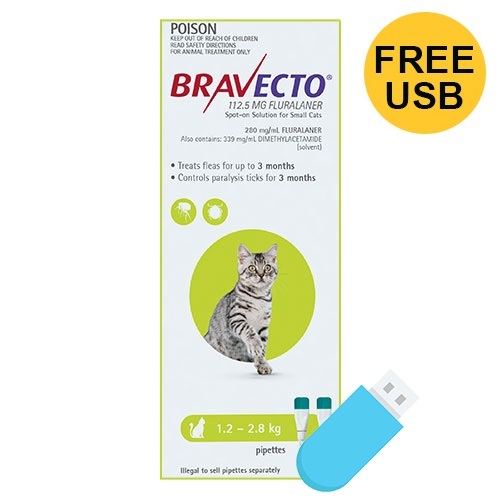 Bravecto Spot-On is a highly effective flea and tick treatment. It contains fluralaner, which is a potent insecticide and acaricide. The potent ingredient inhibits the parts of the arthropod nervous system by destructing GABA-receptor and glutamate-receptor. Eventually, the parasites are eliminated. The key ingredient kills fleas and ticks actively for 3 months and protects against harmful flea and tick infestations. Bravecto spot-on provides long-lasting protection against fleas and paralysis ticks. Bravecto spot-on for cats 1 pack contains 2 pipettes offering total 6-month protection. Break open the seal for application. You cat should be in a standing position. Place the pipette tip on the base of the cat’s head. Squeeze the pipette gently and apply the entire content directly to the cat’s skin. Do not the touch the treated area until dry. Store at or below 30°C. The product is highly inflammable, keep away from heat, sparks, open flame or other sources of ignition. Wear gloves while applying the product. Avoid contact with the eyes of the cat. Do not allow your cat to lick the treated area. Do not use the product directly on the skin lesions. Do not use in case hypersensitivity to the active substance. I have just used it once and within a day my dog got relieved. The infestation has even recurred since then. My kitty seems good now after using Bravecto. Was not sure whether it will suit her or not. But seems working. My kitty was in severe trouble a couple of months back due to fleas. She seemed to scratch her body so badly that I couldn't resist finding a good product for her. I searched online and thankfully ended up buying Bravecto. It is a saviour! This product worked like magic on her and now she has gotten back to her playful and healthy self.Thank you Bravecto!